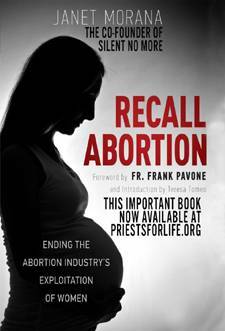 Recall Abortion is an important addition to the abortion debate. In a very readable prose, Morana details the historical development of abortion in the United States both culturally and politically. She discusses abortion under several common topics reflecting misunderstandings and objections people have to abortion. Weaved throughout the book, however, Morana tells stories from women who have had abortions. Those women tell of the horrors of the abortion itself and the aftermath of their decision that follows them for years. Morana’s collection of stories from women who have had abortions are eerily similar. Women unsure of their decision are led into a clinic by a boyfriend or family member in a fog about what may be coming. There are similar women sitting in the waiting room, some discussing their reasons to have an abortion, others sobbing about the decision. The woman is then led to a cold and impersonal room with a doctor and nurse who treat her more like a number than a person or patient. She is put under sedation–or not, in some cases–and the procedure begins. Afterward, she wakes up in a recliner in a recovery room with other women and receives little care, much less compassion. Women are bleeding, beginning infections, and no one comes to their aid. That is when the real trauma begins. Years and decades of trauma follow in which nightmares, regrets, questions, depression, and self-abuse are common. Women are simply unable to cope with the thought of the choice they made for their child. Those thoughts linger and follow them throughout their lives. The pain they experience far exceeds the consequences they foresaw on that particular morning when they walked into a non-descript clinic and their lives changed forever. After the stories of the heartbreak these women have experienced, Morana offers a plan of attack to Recall Abortion and includes testimony of women who have found faith and redemption after years of suffering. Women speak of their consolation in finding and experiencing God’s mercy. It is that hope and Morana’s plan to Recall Abortion that provides the silver lining to this book. There is a glimmer of a brighter future for these women and for America. It will take time and vigilance on the part of pro-life activists and voters. It will be a long battle, but one worth fighting. Morana adds a unique and important voice to the abortion discussion. It has the potential to change even the hardest of hearts and is a book that pro-life advocates should pass out to others on all sides of the debate. Next Post In thanksgiving . . .